It’s finally time for the reveal!! Remember Week 1? I highly suggest you go back to the before pictures for a minute, because we’ve come a long way. To recap, I moved in to a much smaller apartment, with a lot of ill-fitted furniture from my old place. The space needed an overhaul—and it got one! My new space is much better fitted to my lifestyle (and general style). And now that summer is here, I can finally sit back and enjoy! I had to learn the art of editing lately. Living in a small open space means that the slightest out-of-place item makes the entire room look messy! Because of this, when it came to making decor decisions, my eye was drawn to clean lines and a simple color palette. I love that the space is small enough to completely transform with just a few pillows and a rug (remember week 4?). I also love the fact that my picture ledge allows me to switch the art around as I please. Since I like to be my own guinea pig when it comes to decorating, I love the versatility that this new place allows me to test out different looks and styles easily. This room is definitely very “me”—a little coastal, a little boho, a little modern and a little traditional. It’s a mix of items I’ve collected over the years, and some new ones thrown in the mix! 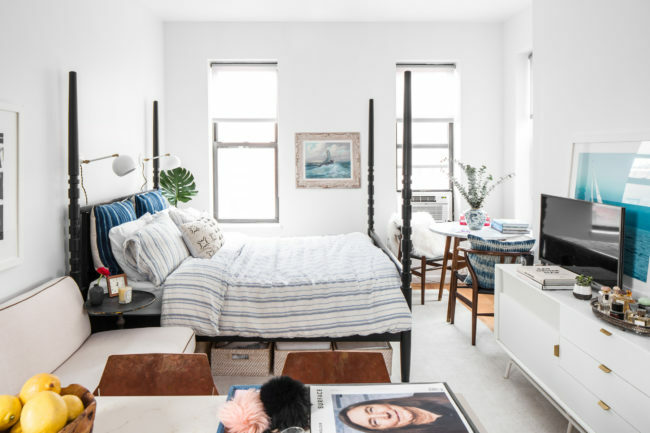 I can’t believe I was able to fit three rooms in one tiny space, but it worked! And believe it or not, it’s very functional! Ok, full disclosure: I’ve maybe had dinner at my bistro table once, but I love using it as library table, and use it to display books and flowers. My gals and I love sitting at the “bar”—those Bludot barstools are surprisingly comfortable! Everyone that has sat in them commented on their comfort. Of course, my favorite space remains the “living area” (a.k.a my sofa). Getting to sit back and relax after sitting at my desk for many hours is pure bliss. I don’t mean to play favorites, but a piece I love in the room is Oomph X Savvy Home Tini Table—you might remember it from our collaboration last year. The fact that I had a say in the design of the piece makes it extra special. I’m thrilled to announce that Oomph has agreed to re-release the table for the One Room Challenge , and you guys get first dibs! Be quick though because they sold like hotcakes last year. I won’t lie: it’s 12:16am and I’m not sure what my mental state is at this point: I’ve been styling, shooting and editing for the past 12 hours and I’m all bugged out. But we got here—and I’m thrilled with the result! I cannot wait to sit back and enjoy it… I hope you like it too! I spoke a lot about my process over the last few weeks, so you can re-read all about it below! Jana Bek | Autumn Clemons | Coco+Kelley | The English Room | Vanessa Francis | Greige Design | Hi Sugarplum | I Heart Organizing | Jenna Sue Design | Stephanie Kraus | The Pursuit of Style | Julia Ryan | Simple Details | Simply Grove | 6th Street Design | Jill Sorensen | Swoon Worthy | Waiting on Martha | Kimberly Schlegel Whitman | Trademarked by Calling it Home. Photography, Styling & Interior Design by Gabrielle Savoie. SO lovely! grown up, edited, chic, intelligent and comfy. seriously amazing that you fit all of those functions in that little space! every piece is gorgeous! i am especially in love with the picture ledge! OMG!!! I love it!! those bar stools is way beyond amazing! and I love all your art. Truly spectacular!! Congratulations my friend! You are so very talented! It looks AMAZING! Seriously, every single detail is perfect!! It’s amazing Gab!! You did such a great job. I love the coastal and traditional vibes mixed together – I could live here myself 😉 Congrats! Not sit back and enjoy! What a great space…I don’t think I can pick out my favorite part between the pillows, chairs, table, wall art…so so pretty! So much ‘oomph’ in such a small space! Love all the details you added and despite putting in a lot of things, the room feels relaxed and collected and uncluttered! It’s beautiful! Like a coastal vacation every day! WOWZA!! Your place has more style per square foot than I’ve ever seen! So impressive how functional and chic your room is, I love your style and great mix of elements! So much style in one post! Love the finished results. Congrats on an amazing room! This has been one of my favorite rooms to check in on each week. You’ve done a beautiful job of packing a ton of style into such a small space. Every time I see those bar stools, I fall in love with them all over again. Beautiful!!! How cool! Love the coastal feel. Bravo! Absolutely gorgeous! Those copper barstools are to die for! Love it all! So much character, and you’re layout really maximizes the space! I love your design, awesome job lady! Those copper chairs! I’m dying! Amazing job!! Gorgeous, Gab! I love the pillows and styling and those counter stool are so snazzy! Loving your styling and the woven white leather bench is fantastic. Congrats! YES to small space design! Its my absolute fav thing in the world and your small space is FAB!! The copper stools are beyond words amazing. I love the fabulous gobal textiles in this space. So SO good. Those barstools! Love your thoughtful design! Hahahaha. I ALWAYS need style advice coming from you!! And speaking of kale salad, I just won TWO nights at the Joule with $250 to spend at CBD Provisions…. Interested? How much kale salad you think we can get? Love, love, love it! Especially those barstools! Great job! I love the cool coastal feel with the warm touches. Fantastic choices, and I am so glad everything arrived. This is the perfect place to spend long summer evenings. Enjoy! This is so great! Awesome texture, metal mixing. Very cool space. And count me among the Tini Table fan club, too! Such a beautiful eclectic room that seems to reflect you in so many ways. Which is saying a lot since I don’t personally know you:) But I can tell that you are an individual who sees the beauty in objects and spaces . I love how this room came together organically and it looks like you will be happy with your new smaller space! What an amazing transformation! A true job well done. I adore the color palette you selected. It feels fresh and calm. The six weeks went by so fast. I completed our entry, living and dining areas in a new to us 30 year old house. So, cheers to us! Have a wonderful weekend. It looks so, SO great. I especially love the little reading table with all the coffee table books. One day I hope to have enough space for something like that! Such a chic, stylish space. The bar stools are just amazing! Beautifully done. Looks incredible!!! Beautifully done Gabrielle!!! Great transformation! It may be small, but it doesn’t read small- you’ve maximized every inch and it is beautiful! I can’t believe you packed all of that gorgeousness into 500 sq’! Great job! Those copper barstools are everything! Bravo! The photography skills are also outstanding, looks like a spread from a shelter magazine.